Pulse bread heals in food processor to make fresh bread crumbs. Place bread crumbs in a small bowl with the milk and let stand until absorbed. Puree onion and garlic in food processor. Place ground meats in a large bowl and add onion/garlic puree, soaked breadcrumbs and remaining ingredients (except for dried breadcrumbs). Mix with hands until just combined. Sprinkle work surface with dried bread crumbs. Roll meatball mixture into 12 inch long thin strips (sort of like making Play-Doh snakes). Line strips up on work surface and cut into 1 inch lengths. Roll these 1 inch lengths into meatballs. You can skip the snake making step if you wish; it just helps keep the size consistently small which is important for this recipe. Lightly coat the bottom of a large skillet with olive oil. Working in batches, cook meatballs until browned and cooked through over medium-high heat (approx 1-2 minutes). Transfer cooked meatballs to a paper towel lined baking sheet to drain. 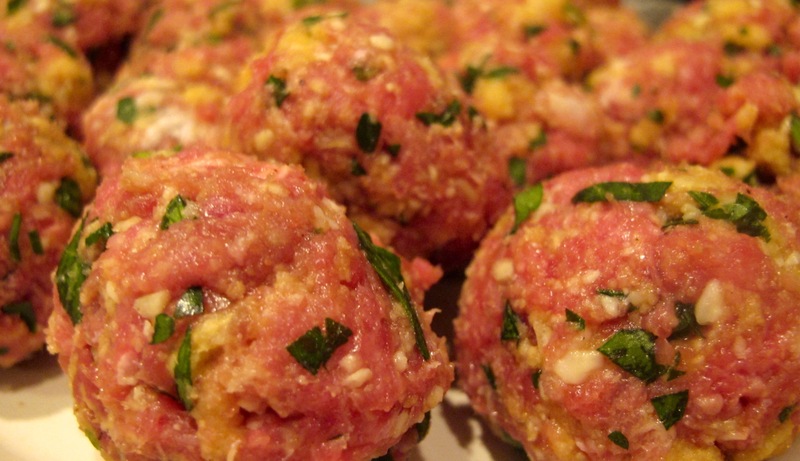 Using two pounds of meat, this recipe makes enough tiny meatballs to feed a tiny country. Package cooked meatballs in zipper top plastic freezer bags and store frozen for up to 6 months. I was shocked at how close this is to Cossetta’s meatballs! I followed it almost exactly except for fresh oregano and sage. I was doubtful it would taste anything like Cossetta’s, but it does–guess that shows how inaccurate my taste buds are! We moved out of state 2 years ago and Cossetta’s is one of the things we truly miss. Thanks so much for posting this recipe. Glad you can have a taste of MN wherever you now. Enjoy!